Bedford Rifle Club - Established in 1929. On the 11th of January 1929 Bedford Miniature Rifle Club was formed, with 12 members paying a yearly subscription of five shillings and using a range under the Town Hall in St. Pauls Square, Bedford. In 1929, the then club chairman, Col. Salmond shot for and was captain of the England team. In 1930, the club then moved to the TA Range in Ashburnham Road and used the Territorial Army Range until 1978. 1n 1931, Brian Hall, became another member to join the list of the clubs international athletes - shooting for England against the USA in the Pershing Match. The same year Brian also won the Grand Aggregate at the Scottish National Meeting. 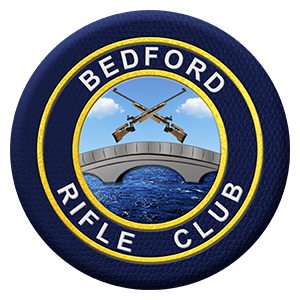 In 1940 the club changed its name to Bedford Rifle Club and introduced a club logo in 1953. In 1965 the club won the City of London Cup, this was the first time the club had won a team event at the Bisley National Meeting. In 1966, the club won, for the first time, the National Short-range League, the National Team of Eight Knockout Competition and the National Team of Four Knockout Competition. This placed the club firmly in the upper echelon of British precision shooting. One year later in 1967, Bedford rifle club built the 100-yard range on the site that we are currently on. Whilst in the same year, the club won the title of the British Championship Team. In 1968 club member John Flynn, won the title British Long-range Champion (The Earl Roberts). In 1974 long-standing club member Frank Balcombe represented England in the Commonwealth Games in Christchurch, New Zealand. Bedford Rifle Club joined forces with BCR&PA in 1974 to design and build the new indoor 25-yard range and clubhouse, moving into these premises in 1978. 10 years later a second indoor ranged was constructed, this time a 10-metre air gun range along with the 50 metre free weapons range. Between the years of 1990 and 2010, members of Bedford Rifle Club have won a total of 19 medals at the Commonwealth Games (including eight gold), becoming one of the most successful precision rifle clubs in British shooting history. To demonstrate the versatility of some of the club members, in 2009, club member Tony Lincoln shot a perfect 600 at 300 metres full-bore rifle, to set a new British Record. In 2010, Tony was in the 300 metre World Championship winning team of three and was the top scorer. Since 2010 Bedford’s reputation still stands strong. With numerous national wins and international selections. Today, Bedford Rifle Club is a thriving and friendly target shooting club, with members ranging from newcomers and hobbyists right the way through to international athletes.